Hot tub and swim spa dealers are being targeted as part of the promotion for a secure safety strap product that has been launched to the British market by 1 Stop Spas chief Chris Brady. Flourishing Marquis and Vita Spa dealer Chris made his debut as an exhibitor during the Hot Tub Living Expo at the Birmingham NEC last week to help launch the SteelCore Security Straps as part of his new exclusive distribution deal for the UK. Priced at £119 per pair, the SteelCore straps have previously been available in the USA for a couple of years and have been designed to help provide greater security than traditional storm straps for hot tubs and swim spas. They incorporate a rugged locking system, are easy to install and are adjustable to 13ft. Chris, who provided a 10 per cent discount on all orders placed for the SteelCore straps during the Hot Tub Living Expo, is now confident that there will be a demand for them from British retailers who can target new and existing customers as well as holiday parks for sales. “These SteelCore straps are extremely strong and are much more secure than traditional options that are currently available in the British market,” said Chris. “They are a great product for retailers to supply to new and existing customers and the initial feedback we’ve already received has been very positive. “Along with ensuring owner’s hot tub and swim spa covers are securely locked they can also really help holiday parks to drop their risk assessment ratings. All of the strap material is Steel Encased Webbing (S.E.W), which is harder to cut than steel cable; while the buckles are constructed from aircraft aluminium and can be operated easily with one hand. Special coded keys are also supplied with every pair of straps to open the patented SteelCore security lock. “The high-security lock can’t be picked and it can only be opened with one of the three supplied individual coded keys for owners,” explained Chris, who has an exclusive deal to supply DryCase products to British retailers that he also promoted to trade visitors during the Hot Tub Living Expo. “We’ve also tested out the straps and discovered for ourselves that they can’t be cut with scissors or a knife, due to the fact that they are manufactured with the special S.E.W process. 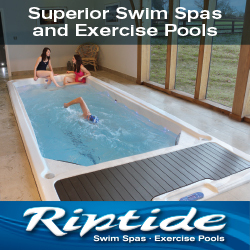 “It makes them ideal for holiday parks and reception staff can provide the key to their guests who have accommodation with a hot tub for authorised entry of the lock that has a protective cover as additional protection.